The tires on a boat trailer are not the same as those on your car or truck. Trailer tires are designed and manufactured differently and treating them like automotive tires will cause you problems. For me the #1 thing to remember is almost all trailer tires are rated ‘ST’. This means ‘special trailer’. The ST rating means many things and for me, again, #1 is they are not to be used above 65MPH. YES you read this correctly, not above 65 miles-per-hour! 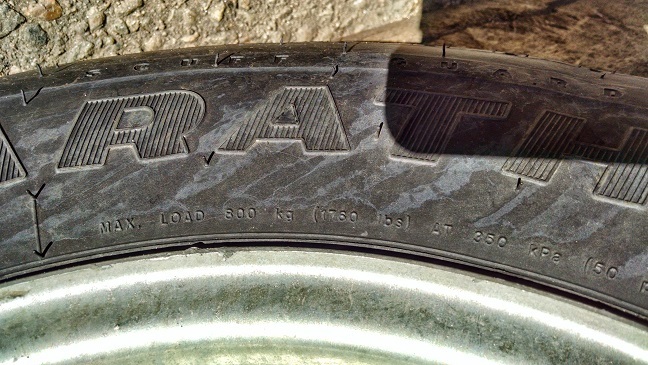 This imprint shows the tire’s performance rating, ST, following by the size. #2 is keeping the tires properly inflated including the spare tire. The tires on the Sage 17’s trailers, 13″ or 14″ (depending on standard or deluxe) and either Goodyear or Carlisle brand, are all rated to 50 PSI, or 50 pounds of air pressure. I run at 45 – 50 PSI measured when the tires are cold. Be sure you carry a good quality tire gauge that can reliably register this amount of pressure. #3 is replacing your tires after no more than five years. Some tire professionals give a range of three-to-five years. Trailer tires are, honestly, not going to wear out their tread in their lifespan; unless you are a road warrior with your boat. Yes, check the tread for wear, but replace even if the tread is fine. Why so short a time? Heat and how trailer tires are made. Heat breaks down the inner structures, the belts and cords, of the tire and will lead to failure. The heat includes when the tires are just sitting and the trailer hasn’t moved. So … you live where it is really hot – consider a three year limit. Cooler locations lean towards a five year limit. No matter what after five years replace! #4 inspect your tires before, during, after and between trips. I check the trailers at Sage Marine monthly, even through the Colorado winters. When I am traveling the tires get a check in the morning and then during each stop when getting gas and at rest areas. Look for cracks in the sidewalls, if a tire looks low check with a pressure gauge, tread damage and uneven tread wear. Replace immediately if you find a problem. NOTE: if uneven wear is along just one edge of the tire you may have a problem with the trailer’s axle or frame alignment. Get this checked at a trailer shop ASAP. #5 is confirm that the tires are load rated for the boat/trailer combination. There should be a sticker on the trailer frame stating the load rating for the trailer. If there isn’t you need to contact the manufacturer to see the load rating. The tires, when the trailer was new, should have had the correct weight carrying capacity for the maximum trailer weight (ie, when the boat is loaded and full of stuff). If the boat/trailer was ‘new to you’ the prior owner may have put cheaper tires that are not up to the task. 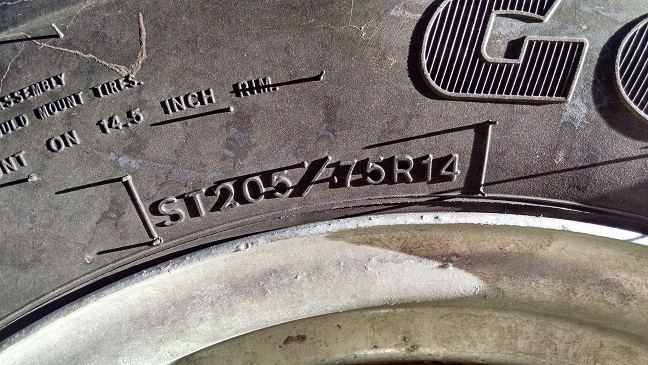 The weight carrying capacity is imprinted on the tire. NOTE: this is at max pressure. 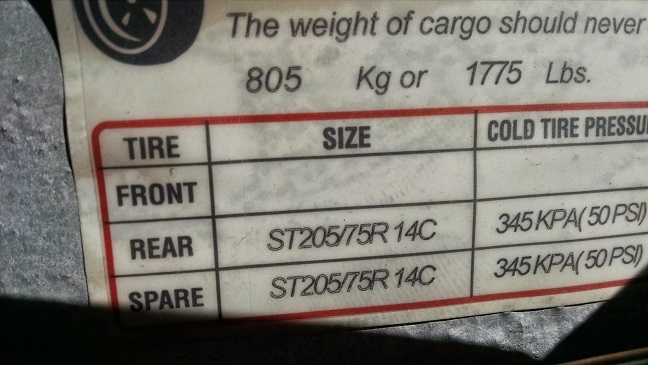 This trailer frame tag shows the maximum cargo (ie, boat) weight the tires can accommodate. 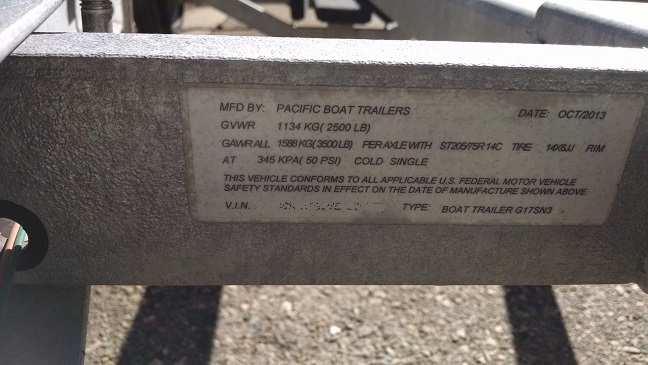 This trailer frame tag shows the max weight of the boat/trailer combination: Gross Vehicle Weight Rating (GVWR). #6 know how to change a trailer tire and have the tools necessary when traveling. Check to see if the tow vehicle’s jack and lug nut wrench will work on the trailer. If you are lucky your tow vehicle will have the same lug nut size at the trailer; if not purchase a lug nut wrench that fits. Check to see if the jack setup will work safely with the trailer before you travel. If the vehicle’s jack will not work look into carrying a jack that is compatible. In addition consideration having a trailer safety kit that contains the following: reflective safety vest, reflective warning triangles, flares, wheel chocks, flashlight with extra batteries and bulbs. If you are not willing to change your own tire I encourage you to have pay insurance that will cover the cost of having a tow truck come to your location and change the tire. Remember, you need a spare tire even if you don’t want to change the tire. I, knock on wood, have not experienced a trailer tire failure in about 150,000 miles spent towing boats in the past four years. The #1 reason, in my opinion, is #1 – don’t drive faster than 65. NOTE: I originally posted this March 2015 on Sage Marine’s BLOG. In a short time the BLOG will be closed – stupidly. I am reposting this information so it is not lost.